That didn’t take long. I posted yesterday that I was thinking of making the switch from iPhone to Android. I did my research and that’s exactly the direction I went a few hours later. After reading reviews and getting opinions from friends on social media, as well as time spent just playing with different phones in the AT&T store, I decided on the Samsung Infuse 4G. The screen is beautiful and large. It’s incredible how light and thin this phone is. You have to pick it up to believe it. The pictures don’t do it justice. After 3 years on the iPhone and its locked down app store, I’m feeling a bit overwhelmed with all the options and new choices. But in a fun way that only someone who finds these things fun can appreciate. As expected, everything Google is easy to configure and beautifully handled. 3 Gmail accounts, no problem. Switching between them is a pleasure compared to on the iPhone. Calendars & contacts were synced in what felt like seconds. No hoops to jump through in order to switch seamlessly to Google Voice and back. No clunky calendar sync application. While the Google+ app is still not what I hope it will be, it’s far better on Android than iPhone. The built-in Maps application is fantastic. So is the camera (compared to the camera on the 3GS). Did I mention the gorgeous screen? 4.5″ – 480×800 pixels. I’m coming from iPhone 3GS so this is a huge improvement. Doesn’t feel too big at all, even when I hold it up to my ear. I tend to talk through the headset anyway. I like that I can shop the Android Marketplace from my computer and a few seconds later the app is already on my phone. Many free choices. So far, I’ve spent less than $10 on apps. Thankfully, I’m not a gamer. If that’s not enough, I can also shop the Amazon app store since my phone is supported and grab their daily free app. Moving from iPhone to Android was so much easier than going from Blackberry to iPhone. Hold down an app icon to move it around, press & hold for copy/paste, moving around the Phone app…all similar enough to the iPhone that I’ve learned by trusting muscle memory. I watched iOS 5 demos so I already knew what to do with the notifications. For all the inconsistency in app design, I like that settings can typically be found in a consistent location (by hitting the menu button on the phone). I admit that I do find myself trying to wake up the phone by reaching for a button at that bottom that isn’t there. I don’t want to count how many times I looked for a back-like button in an app only to remember that it’s one of the buttons on the phone. Same with Settings. I like not losing screen space until I need it. I love the keyboard. I like the the little vibrating feedback and the predictive typing. I feel like I can type much faster than on the iPhone, although it might be the increased screen real estate which helps. The phone gives a choice of 3 inputs: Samsung, which I didn’t like much, default Android which I’m using, and Swype that I haven’t tried yet. I like that not every installed app must appear on a home screen. I like that I can set different sounds for each type of notification. I’m getting re-used to the concept of a file browser on a phone again. That, plus an external battery and SD card. When I was in the AT&T store yesterday, I heard at least two salespeople steer customers away from Android and towards iPhone the moment they asked a question that demonstrated a lack of technical/gadget knowledge. Now I know why. That’s what makes Android attractive to me, but this is not my mother’s next phone. So many hacks and tweaks, so little time. Wasn’t sure whether to put this in the positive or negative column. I’m at that point where I’m still very clueless but know just enough to do some serious damage. As I was saying…I know I can do serious damage. You can jailbreak an iPhone to allow more applications/tweaks. Most don’t. You can root an Android phone to allow more applications/tweaks. From reading through Android user forums, I feel like the last person who hasn’t rooted. So many sites either assume you’ve already rooted the phone or tell you to come back when you have. I’m wary to do this until I know what I’m doing. That image above is an actual screen shot from my phone. Took time to search, download and play with different downloads to find a screenshot app that was free, didn’t require a rooted phone and actually worked on my device. This is compared to holding down two buttons on the iPhone. I heard voice commands are great on Android, but if I have to click on on the Google widget to activate it and then scan possible matches what’s the point? I miss the ability to hold down on the microphone to activate voice dialing. I’ll have to play with it some more. Update: Thanks to my friend Peter who was nice enough to comment below, I now know that I can long press on the search button and it goes to the voice control interface. Much, much better. I like the headset that came with the phone. Very comfortable earbuds. Unfortunately, I can’t seem to figure out how to get the mic button to do anything. I even have to answer a call by touching the phone. If I’m listening to a podcast (see apps below) pushing the button doesn’t pause playback. That seems wrong somehow. I have a feeling it’s an app or setting I haven’t found yet. If I screw up the phone with my tinkering, how do I backup/restore the data? I’m sure there’s an app for that. Haven’t found one yet that doesn’t require an engineering degree to use. Is linking to my Google data enough? Can’t tell. 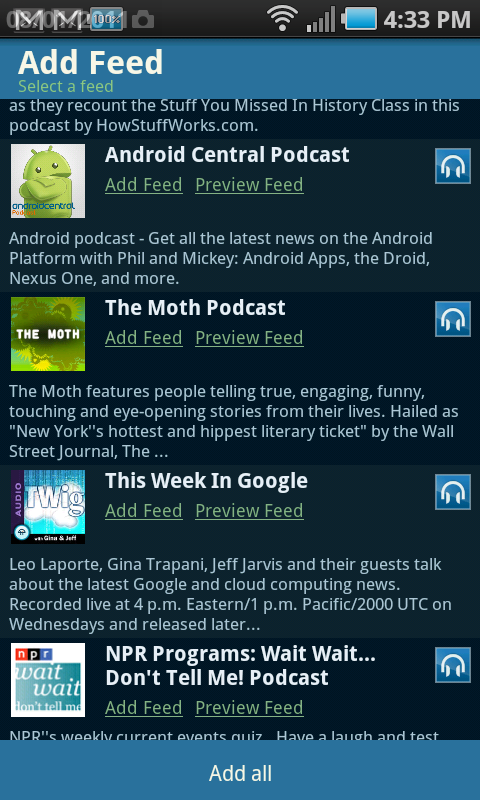 I’m relieved that most of the free iPhone apps I relied on are on Android and virtually unchanged. Download, enter site credentials and pick up right where I left off. Twitter, Evernote, Mint, Dropbox, Audible, Kindle (with link to Kindle Store, thankyouverymuch), Pandora, WordPress, TripIt, Box.net, etc. 1Password is read-only, but that’s fine with me for now. I know they’re working on a full version. Some apps have been a pleasant surprise. I’ve been getting my magazines digitally since 2004. The Zinio iPhone app only worked with a handful of my subscriptions. I was pleased to discover that every magazine I subscribe to is available through the Android app. Since the desktop Zinio app is build on Adobe Air and Adobe technologies are better supported on Android, it’s not that surprising. The larger screen helps too. The Bank of America app is much easier to use and navigate on Android, and even the Facebook app is a nicer experience. One of my favorite apps so far is DoggCatcher. It was only $2.99 over the weekend and would have been worth the $6.99 original price. I like listening to podcasts while I walk the dog, while knitting in the evening or on long drives. Mostly tech, but a few knitting and newsy ones thrown in for good measure. Love DoggCatcher’s interface and it’s quite fast. Only downside is lack of an iTunes store means download only – no streaming. Oh well. I’ll live. Salesforce Chatter was easy to hook up to the now-active Dreamforce Conference social site, which just doesn’t work at all on iPhone. Unfortunately, there’s no Netflix app that works on my phone. I’m also missing an Android app for my current favorite to-do manager on the desktop, The Hit List. 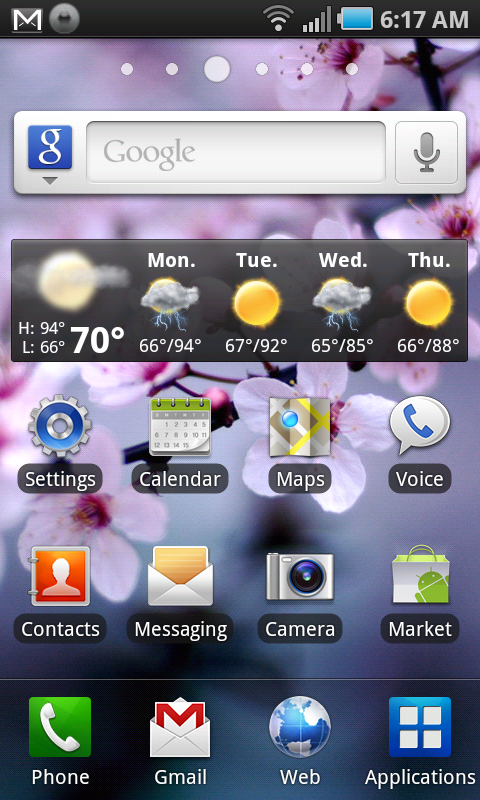 So there’s my first full day as an Android user. For the veterans, what am I still missing? Previous Post Help me decide: Is it time for this iPhone user to go Android? I’ve yet to root an Android phone (I’m on my third). I’ve picked what I think were the best available at the time (G1, NexusOne, T-Mo Sensation) and haven’t found a compelling reason. If you long press the search button (the physical one below the screen), it will pop into voice search, very conveniently. I bought an app called MyBackupPro for app and settings backups. I used it to restore settings when I traded the G1 for the Nexus, but I didn’t even bother when I got the Sensation. Google remembered which apps I’d purchased and installed them, and the Sensation’s Sense interface proved nice enough to keep. Thank you so much, Peter! I knew there had to be a better/faster way to get to voice commands. As for backup, since I really don’t store much on the phone and all my data is “in the cloud,” it sounds like I’ll be fine counting on Google to restore my apps when/if I need them. I have both iPhones and Android devices. There is no comparison between the two. Locked down Apple App Store? I’d much rather virus and trojan infested app downloads and actually install a virus scanner on my android device, yes, sounds like heaven. Two main app stores? Sounds great! I really enjoy searching both stores to see which one actually sells the app I want, talk about a time saver! OS upgrades on Android are a breeze. I’ll just download 2.3 and install it. Oh wait, I can’t. My carrier locked me out. Oh it’s not even supported on my device. Oh wait, I have to root my device to get the base OS? What a brilliant idea! Rooting is such a good idea I’ll make sure to install that virus scanner now… Feels so much like Windows I love it! Considering you switched from a two year old iPhone I would expect someone to feel as Android was better compartively. It’s really not. The marketplace proves that including AAPL stock price. iOS 5 will bury Android. Actually, I have to ask… why the venom Jeffrey? Seriously. AAPL isn’t hurting for business in the Sohn household. It’s just a phone. I tend to change them every couple of years and if after a year or so I decide I like what Apple has to offer, I’ll switch back. Big deal. Sounds like Apple fanboy fever to me. There’s a cure for that, but it’s painful. I have a backup battery. I have flexible, additional storage. I don’t have to connect to my computer ever, if I don’t want to. I can choose from a variety of keyboards (even a built-in physical one, if I choose), web browsers, etc. My point isn’t that Jeffrey is wrong about Apple having some advantages — my point is that Android has plenty of advantages as well, and there are lots of reasons why one might weigh the pros and cons and prefer Apple or why they might lean towards Android. To suggest that one is significantly better than the other is like saying that Kansas is an immensely superior state to Wisconsin. Beauty is in the eye and all. Well said, Peter!! Thank you. I always feel like Android is THIS CLOSE to being my next phone. Then I have to support one for some executive who bought it without researching. I’m probably playing with the wrong ones but there is a real lack of consistency across devices that drives me crazy. On one phone, the carrier had locked out some basic mail formatting options of the built in mail app. Why? It was the same app on other Android phones and the options were fine on all of them? That lead to having to purchase Touchdown for ActiveSync. However, I am jealous of the Google integration. As move more and more nonprofits into Google’s cloud for groupware, I see that being a big plus. Hello – any comments on the choice to continue doing business with corporate giants like AT&T and Verizon versus switching to the non-profit-friendly Credo mobile? Thanks! It looks awesome, Lisa. Would definitely consider it as soon as I can get to the point that it won’t cost us a fortune to switch. In all honesty, I have never owned an iPhone and frankly I never will. For the same reasons many people stay clear of them. I believe in the value of complete open source technology. My mobile phone is no different. After I got over the feel of rooting my phone it became a no-brainer, seriously. Once you get your phone rooted and use a ROM Manager that can virtually one button put a new ROM on your new phone. I went from the 2.1 eclair (HTC Droid Eris) to rooting and running the 2.2 Froyo. It actually improved the efficiency of my Eris. Now I am on the HTC Thunderbolt with a custom ROM by Team BAMF. OMG! What can I say, the complete control over my phone, open source, and I can make it how I want! Thanks for your post I enjoyed reading it as well as the comments from others.